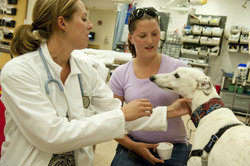 The program provides intensive research experiences for veterinary medical students interested in research. Individuals are selected each year based upon a research proposal developed by the student in collaboration with their intended faculty mentor. Students perform the bulk of the research during the summer, present research findings at both local (e.g., College of Veterinary Medicine Research Day) and national meetings (e.g., the Merial-NIH Veterinary Scholars Symposium, or a scientific meeting within their field of study). 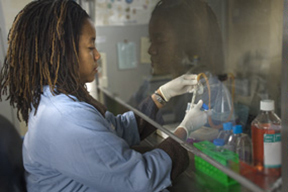 Funding is provided from NIH, Merial, department and college monies, and development funds. Dr. Oglesbee is director of the NIH T53 (Short Term Research Training for Veterinary Students) supporting this program, now in it’s second renewal. The T35 supports 10 students per year. The Ohio State University Infectious Diseases Institute (IDI) was established in 2017 to build upon the successes of previous university programs* and accelerate infectious disease research and education with a simpler more integrated structure. Designed to be inclusive and nimble, IDI supports researchers and educators throughout the university with resources, connections and opportunities that strengthen partnerships with industry, government and other organizations. Emphasis is placed on interdisciplinary networks in six programmatic areas, consisting of over 200 faculty representing ten colleges and the Research Institute at Nationwide Children’s Hospital. These programs are antimicrobial resistance; ecology, epidemiology and population health; host defense and microbial biology; microbial communities; prevention, detection and therapies; viruses and emerging pathogens. *The Institute was an outgrowth of the Discovery Theme in Infectious Disease. Dr. Oglesbee is the faculty lead for this effort, initiated in 2014. 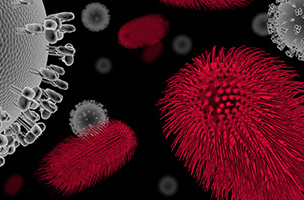 Faculty in the College of Veterinary Medicine play a significant role in the Infectious Diseases Institute, with faculty playing leadership roles in half of the Institute programmatic areas and total tenure track faculty representing 14% of the university infectious diseases community. The role of the director is to ensure alignment between the four programs within the college community that link with those of the institute: antimicrobial resistance; ecology, epidemiology and population health; host defense and microbial biology; viruses and emerging pathogens. Such alignment enables the college community to better leverage university resources and engage interdisciplinary research networks in ways that enhance the impact. College investments launched the Infection Control and Antibiotic Stewardship Program in the Veterinary Medical Center, and have increased capacity of our Gnotobiotic Life Laboratory.